Before importing, configure IntelliJ IDEA to use the most recent Scala plugin, which includes sbt support (Use this plugin regardless of whether you are using the Java or the Scala API). Note The instructions on this page were verified with IntelliJ IDEA Community Version 2016.3.4. The procedures and screens can differ depending on the version, but the basic flow should be the same. The following sections provide detailed steps for configuring IDEA and importing an sbt project. If you have a project open, from the File menu, select Settings. Otherwise, from the Welcome page Configure menu, select Settings. The Settings (or Plugins) dialog will open. If you open the Settings, select Plugins. In the search box, enter Scala. If you have it installed, you will see an option to uninstall it. If you do not have it installed and it does not show in the list, click Browse repositories…. Scroll to find the appropriate plugin and click Install. The dialog prompts you to restart IDEA. Now you are ready to import your project. From the Welcome Screen or File menu, select Open. Browse to and select the top-level folder of your sbt project, and click OK. 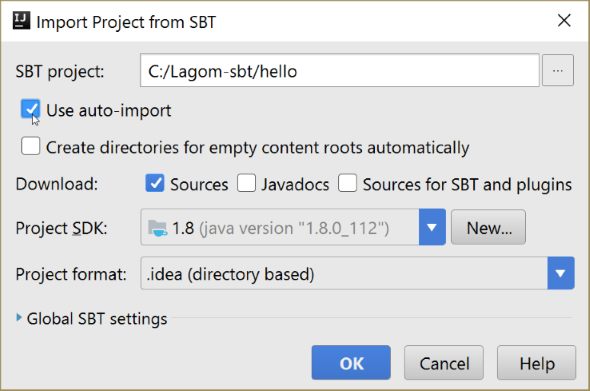 The Import Project from SBT dialog opens. For Download options, enable Sources and disable Javadocs and Sources for SBT and plugins. For Project SDK, verify the version (JDK 1.8). Click + (Add New Configuration). In the Tasks field, enter runAll.